Top Dynamic will commence mass production for DFN0603 in 2015. 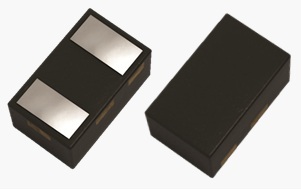 We have announced the introduction of an ultra-small, ultra-low profile leadless surface mount package, with size of 0.61mm x 0.32mm x 0.3mm. It will available in Zener, TVS and Switching Diode products. This ultra-low profile, small footprint, compact package saves PCB space & enables the design of light weight portable electronic devices such as mobile handsets and tablet PCs, where size and rigorous performance characteristics are critical.